Compact microstrip dual-band bandpass filter (DBBPF) with high selectivity and good suppression for wireless local area networks (WLANs) is proposed utilizing a novel embedded scheme resonator loaded ring resonator DGS. Two passbands are produced by a pair of embedded half-wavelength meandered stepped-impedance resonator (MSIR) and a quad wavelength short stub loaded stepped-impedance resonator (SIR) separately. The loaded DGS avoids the cross talk in the pass band which is useful to achieve very sharp cutoff in the pass band. The resonator is fed by folded T Shaped capacitive source-load coupling microstrip feed line, and four transmission zeros are obtained at both sides of the bands to improve selectivity and suppression. Simultaneously, the size of the filter is extremely compact because embedding half-wavelength MSIR only changes the interior configuration of quad-wavelength SIR. To validate the design method, the designed filter is fabricated and measured. Both simulated and measured results indicate that good transmission property has been achieved. Keywords: Low-pass filter, spurious rejection, linear phase, ring resonators, microstrip filters microwave filters. BPFs are important block in RF front-to-end and have drawn much attention since they can reject the useless signals. In [1–3], miniaturized BPFs with high selectivity and enhanced out-of-band performance are designed for wireless communication systems. In recent years, with the development of different wireless standards, such as global system for mobile communication (GSM), wireless local-area network (WLAN) and world interoperability for microwave access (WiMAX), designing multi-band BPFs with miniaturized size, high selectivity and controllable frequencies has become a trend. In [4–6], compact and high selectivity dual-band BPFs are designed by two sets of resonators, stepped-impedance resonators (SIR) and stub-loaded resonators, respectively. For dual-band BPF designs, various approaches have been studied. A simple effective method is to utilize two or three sets of resonators [7–10]. In , a high selectivity dual-band BPF is designed by using coupled stepped impedance resonators. Each set of resonators operates at a pass band, resulting in controllable frequencies. Unfortunately, it has large size due to the multi-sets of resonators. In this a novel Meandered stepped impedance resonator with loaded DGS is utilized to achieve the desired dual pass band and the size is reduced. The two passbands are generated through respective resonators. High selectivity is obtained by the introduction of several finite attenuation poles in stopband. Compared with the conventional dual band filter, the filter is smaller in size and better in performance. Where Rz is the impedance ratio. In expression (2), we can see that the resonance conditions are determined by θ1, θ2 and Rz. It can adjust these three factors to obtain the resonance that we required, and a dual mode filter can be designed by using SIR. Ï´s1 is the electrical length for the first spurious frequency fs1 .In this paper is to design a good WLAN filter, the first spurious frequency must be avoided at the designed lower passband. Fig. 2 shows the transformation process to design an embedded-scheme resonator for DBBPF. In Fig.2 (a) a quad-wavelength short stub loaded SIR is shown. To reduce its size, the SIR is folded as an open-loop. 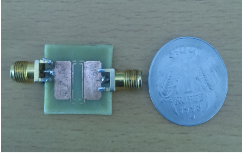 Additionally, the low impedance lines of quad-wavelength short stub loaded SIR are broad enough to provide area for a small resonator, which make it possible to embed a pair of small coupling resonators. So, we replace the low impedance lines with a pair of meandered SIRs, which is shown in Fig. 2(b). To achieve a high performance dual-band filter, it is necessary to introduce transmission zeros at both sides of the bands. 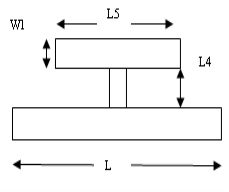 Due to the existence of DGS, magnetic coupling takes up dominant position on the short stub loaded SIR shown in Fig. 2(a). On the other hand, as the embedded MSIR is folded as an open-loop, it has the maximum electric field density at the side with an open gap, and the maximum magnetic field density at the opposite side. If the sides with the maximum magnetic field of two coupled resonators are proximately placed, the magnetic coupling can be obtained. Therefore, the coupling between the half wavelength SIR loops is also magnetic . So, transmission zeros near the two pass bands can be generated by feeding microstrip feed line with capacitive source-load coupling, which because the counteraction between electric field and magnetic field. These transmission zeros have permits to improve selectivity and suppression of this filter. Fig. 2.Embedded Resonator DBBPF design scheme. A filter proposed for WLAN is shown in Fig. 4.A set of parameters of it is given in Tab.1. Fig. 2 shows the configuration of the proposed micro strip dual-band BPF. It is composed of two sets of resonators. The outer resonators are stub-loaded resonators operating at the first and two pass band frequencies, i.e., 3.68 GHz and 7.01 GHz. Fig.3 illustrate the configuration of the resonator. It consists of a transmission line of length and a T-shaped stub loaded at the line centre is the overall length of the lines, namely L.
Open-circuited coupled-lines with the length C2and gap C1 are employed to realize electrical coupling. Two transmission lines with the characteristic impedance of 50â„¦ are connected to the outer resonators, acting as input and output ports. Embedded between the two outer resonators, the inner resonators 2 and3 are used to yield the second pass band at f2. The inner resonators are fed by the outer ones. 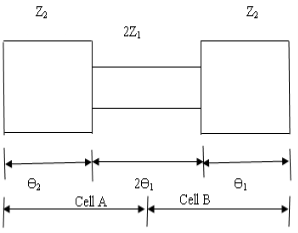 Using this structure, multi-path coupling can be realized for the pass band, which can help generate a pair of transmission zeros. The Ring Resonator structures are designed and produced by applying the Babinet principle to the split ring resonators (SRR). In this way structures with apertures in metal surface are obtained and these CSRRs create negative ε instead of negative μ in a narrow range near the resonance frequency. In microstrip technology, left handed Metamaterial structures exhibiting band stop behaviour can be implemented by etching CSRRs in the ground plane, underneath the conductor strip, and along the series capacitive gaps. The gap provides a negative value of the effective permeability up to certain frequency that depends on gap dimensions and separation. The negative ε structure has been obtained by loading a microstrip line with CSRR particles as shown in Fig.4. There are many different parameters that affect resonance frequency of CSRR, most dominant being the permittivity of the substrate and length of the resonator. The resonance frequency is inversely proportional to the length of the resonator and is directly proportional to the split gap of the resonator. It is considered that the CSRR particle is etched only in the ground plane. CSRR etching depth decides the strength of the resonance increases - In order to improve the sharper cut-off, compact in size and harmonic suppression ability of the conventional dual band pass filter a CSRR is loaded in the bottom of the filter. The CSRR is designed at the anti-resonance frequency. Inherent nature of anti-resonance behaviour, it rejects the frequencies above cut-off frequency. In this way we achieved sharp cut-off.the dimensions of the ring resonator is given in Table.1. To validate the characteristics, the proposed dual band filter is fabricated and measured in a FR4 substrate with a relative dielectric constant 4.4 a thickness of 1.6mm has been used in this paper. 50 ohms microstrip feed line with a width of 2.2mm is located at both of the input and output ports.fig 6 shows the photograph of the fabricated dual band filter. Fig.7. depicts the simulated and measured results of the proposed filter simultaneously. Here CST microwave studio is used for simulation and an Agilent network analyser N5230A is used for measurement. The simulated / measured minimum insertion losses are 0.65/0.985dB respectively at 3.684GHz band and 0.98/1.35dB respectively at 7.01 GHz. The size of the proposed layout is 14.5mmX19.9mm. In this paper, a dual band filter designed by embedded resonator loaded with ring resonator DGS was presented. 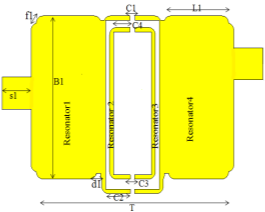 A t-shaped embedded resonator with capacitive source –load coupling is used for feeding and multiple transmission zeros are created and DGS ring resonator is loaded to improve the performance of the filter. 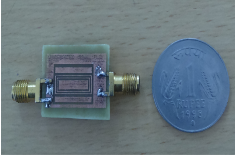 A good quality dual band Bandpass filter operating at 3.684 GHz and 6.83GHz for WLAN is well designed and fabricated .The size of the filter is 14.5X19.9mm which is very small. JUN, S., K. CHANG., Compact microstrip bandpass filter using miniaturized hairpin resonator. Progress in Electromagnetics Research, PIER 2013, vol. 37, pp. 65–71. DAI, G.L., M.Y. XIA., Novel miniaturized bandpass filters using spiral-shaped resonators and window feed structures. Progress In Electromagnetics Research, PIER 2010, vol. 100, pp. 235–243. WEI. X., P. WANG, AND Y. SHI. M., Compact mixed-cross coupled bandpass filter with enhanced frequency selectivity. Progress In Electromagnetics Research, PIER 2013, vol. 37, pp. 73–82. CHAUDHARY, G., Y. JEONG, J. LIM., Dual-band bandpass filter with independently tuneable center frequencies and bandwidths IEEE Trans. Microw. Theory Tech., 2013, Vol. 61, pp. 107–116. ZHANG, R. AND L. ZHU, Design of a compact dual-band bandpass filter using coupled stepped impedance resonators. IEEE Microw. Wireless. Compon. Lett., 2014, vol. 24, No. 3, pp. 155–157. GAO, L. X. Y. ZHANG, High selectivity dual-band bandpass filter using a quad-mode resonator with source-load coupling. IEEE Microw. Wireless. Compon. Lett. 2013, vol. 23, No. 9, pp. 474–476. ZHANG, S., L. ZHU. Compact tri-band bandpass filter based on λ/4 resonators with U-folded coupled-line. IEEE Microw. Wireless. Compon. Lett, 2013, vol. 23, No. 5, pp. 258–260. XU, K., Y. ZHANG, D. LI, Y. FAN, J. L.-W. LI, W. T. JOINE, AND Q. H.LIU, Novel design of a compact triple-band bandpass filter using short stub-loaded SIRs and embedded SIRs structure. Progress In Electromagnetics Research, PIER 2013, vol. 142, pp. 309–320. PENG, Y., L. ZHANG, Y. LENG, J. GUAN, A compact tri-band pass band filter based on three embedded bending stub resonators. Progress In Electromagnetics Research, PIER 2013, vol. 37, pp. 189–197. RUNQIZHANG, LEIZHU. Y, Design of a compact dual – band band pass filter using coupled stepped – impedance resonators. IEEE Micro. Wireless. Compon. Lett, 2014, vol.24, No.3 pp.155-157. RUNQIZHANG, LEIZHU, Synthesis and Design of Wideband Dual-Band Bandpass Filters With Controllable In-Band Ripple Factor and Dual – Band Isolation IEEE Trans. Microw. Theory Tech., 2013, Vol. 61, pp. 1820–1828. KARUPPIAH ANNARAM, SURESH NITHYA. Investigation of Compact Low Pass Filter with Sharp Cut–Off using Metamaterial. RADIOENGINEERING, 2013, VOL. 22, NO. 3. BAENA, J. D., BONACHE, J., MARTIN, F., SILLERO, R. M. Equivalent circuit models for split ring resonators, and complementary split ring resonators coupled to planar transmission lines. IEEE Transaction on Microwave Theory and Techniques,2005, vol. 53, no. 4, p. 1451-1461. B. F. ZONG, G. M. WANG, H. Y. ZENG, Y. W. WANG. Compact and High Performance Dual-band Bandpass Filter using Resonator-embedded Scheme for WLANs. RADIOENGINEERING, 2012, VOL. 21, NO. 4. "Dual Band Bandpass Filter Using Meandered Ring Resonator." UKEssays.com. 11 2018. 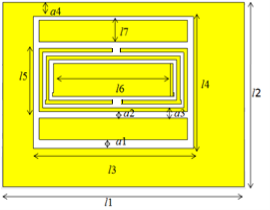 All Answers Ltd. 04 2019 <https://www.ukessays.com/essays/computer-science/dual-band-bandpass-filter-using-meandered-ring-3121.php?vref=1>. "Dual Band Bandpass Filter Using Meandered Ring Resonator." All Answers Ltd. ukessays.com, November 2018. Web. 25 April 2019. <https://www.ukessays.com/essays/computer-science/dual-band-bandpass-filter-using-meandered-ring-3121.php?vref=1>. UKEssays. November 2018. Dual Band Bandpass Filter Using Meandered Ring Resonator. [online]. Available from: https://www.ukessays.com/essays/computer-science/dual-band-bandpass-filter-using-meandered-ring-3121.php?vref=1 [Accessed 25 April 2019]. UKEssays. Dual Band Bandpass Filter Using Meandered Ring Resonator [Internet]. November 2018. [Accessed 25 April 2019]; Available from: https://www.ukessays.com/essays/computer-science/dual-band-bandpass-filter-using-meandered-ring-3121.php?vref=1.